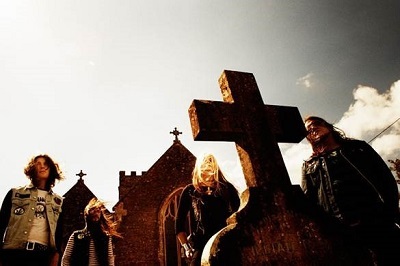 Electric Wizard have announced a headline London show for 2015, set to take place at the Roundhouse in Camden on May 15th. This very special one-off event follows in the wake of the UK outfit’s most successful album release to date in the form of ‘Time to Die’ – the eighth EW full-length record and their first to be released via Spinefarm Records; issued worldwide in late September of this year, ‘Time to Die’ saw The Wizard achieving their highest ever chart positions around the globe, entering the US Billboard Top 200 at No. 64 and topping the Billboard Vinyl Chart. Details of the full bill will be revealed in due course. Prior to the Roundhouse show, the first time the band have headlined this historic venue, EW will release a new single; titled ‘Lucifer’s Slaves’ and taken from the ‘Time to Die’ album, this release (the follow-up to the ‘SadioWitch’ single / video) will be available on 10” vinyl & download, complete with exclusive artwork designed by the band themselves plus previously unreleased material. In addition to this, Electric Wizard will appear at the CTM 2015 – Un Tune ‘Festival For Adventurous Music & Art’, due to take place in various venues across Berlin from January 23rd to February 1st. Clearly, the ideal event for Electric Wizard, whose ‘frequencies’ and ominous vibrations, especially those at the lower end, have been known to re-arrange internal organs. For those on the other side of the Atlantic the band say news on their first US tour in 12 years will be announced in the coming days.